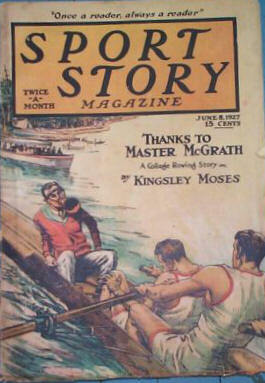 3 · Tug of War · Kingsley Moses · ss; tug-of-war. 11 · The Fence Skinner · Warren Elliot Carleton · nv; college-sports. 53 · Sos Your Old Man · Valentine James · ss; basket-ball. 64 · A Fast-Stepping Son · Herbert L. McNary · ss; indoor-track. 76 · The Ice Talker · Raoul F. Whitfield · ss; hockey. 94 · Sheeps Clothing · Milton C. Thomas · ss; college-wrestling. 107 · Eyes Front · Charles Dana Bennett · ss; ice-skating. 116 · The Sand Eater · Stuart Osborne · ss; auto-racing. 126 · Not So Goofy · Harold de Polo · ss; baseball training-camp. Details supplied by Monte Herridge from Table of Contents. 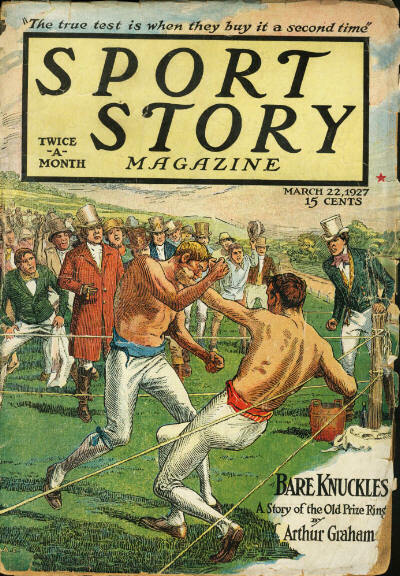 3 · Bare Knuckles · Arthur Grahame · nv; boxing. 50 · Sixteen Sweaters · Kingsley Moses · ss; rowing. 61 · Individual Stuff · W. D. Stovel · ss; hockey. 72 · Hogan Uses the Head · William Henry Cook · ss; baseball. 78 · Aprils Fool · Raoul F. Whitfield · ss; basketball. 86 · Baumers Beau Brummel · Charles Rodda · ss; baseball. 109 · A Point of Honor · Hubert La Due · ss; track. 121 · The Exchange · Thomas A. Curry · ss; water polo. 129 · The Shoes of Billiken Boyle · Edgar Daniel Kramer · ss; auto racing. 24 · The Sacrifice · J. Raymond Elderdice · ss; baseball. 38 · The Forty Beat · Moran Tudury · ss; rowing. 50 · Wild and Woolly · Jackson Scholz · nv; track. 78 · The Confidence Man · G. H. Flaherty · ss; hockey. 95 · The Parrot and the Hyena · Lee Willenborg · ss; golf. 103 · The Water Baby · William Bruner · ss; motorboat racing. 127 · A Change of Mind · W. J. Cochrane · ss; basketball. 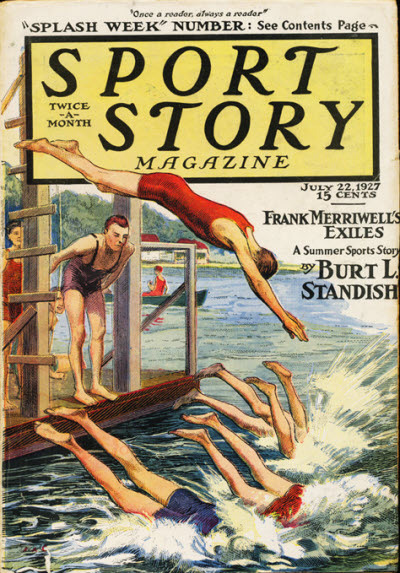 1 · Two and a Half · A. Clifford Farrell · ss; diving. 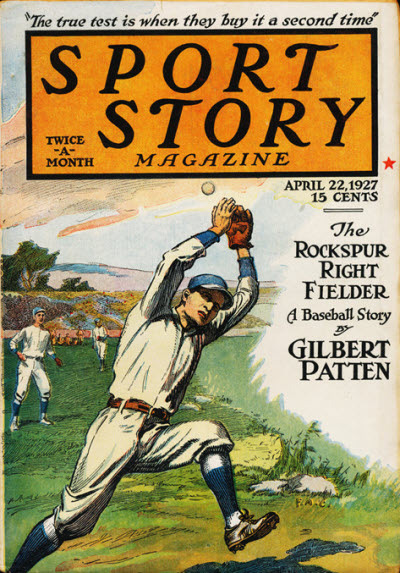 10 · The Rockspur Right Fielder [Part 2 of 2] · Gilbert Patten · sl; baseball. 35 · Red Speed · Raoul F. Whitfield · ss; airplane racing. 46 · Doctor Goodworth Helps · Sam Carson · ss; horse racing. 60 · The Slougher · Kingsley Moses · nv; baseball. 84 · Lazy Mans Luck · William Bruner · ss; sailboat racing. 99 · The Last Ten Feet · Don Robert Catlin · ss; rowing. 111 · Durlwaters Trouper · William P. Livengood · ss; track. 125 · The Champion · Thomas A. Curry · ss; indoor swimming. 3 · The Black Sheep · Moran Tudury · ss; baseball. 22 · Time to Laugh · Paul Chadwick · ss; tennis. 33 · Shoot the Toast · Jackson Scholz · ss; relay racing. 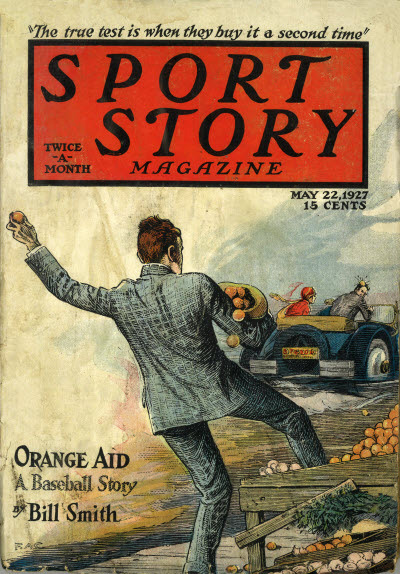 49 · Orange Aid · Bill Smith · ss; baseball. 60 · Out of the Water · Warren Elliot Carleton · ss; swimming. 77 · The Gap in the Wall · A. Clifford Farrell · ss; auto racing. 93 · One for Rosie · Walter C. Stebbins · ss; boxing. 106 · Weakling · Alfred Percy · ss; canoe racing. 114 · Checked Impetuosity · Harry Daley · ss; track. 120 · Duff Luck · James W. Egan · ss; golf. 128 · Olaf Thinks a Thought · Edward J. Higgins · ss; javelin throwing. High Water · Warren Elliot Carleton · ss; summer sports. The Tethered Goat · George H. Murphy · ss; lacrosse. The Loyal Traitor · Ernie Phillips · ss; baseball. Clay Feet · Jackson Scholz · ss; running. The Clown · Sam Carson · ss; horse-racing. The Old Fight · R. Ray Baker · ss; baseball. Simple Simon · Moran Tudury · ss; polo. Pea-Green Freshman · Kingsley Moses · ss; track. Conflict · Edgar Daniel Kramer · ss; baseball. 1 · The Has-Been · Moran Tudury · nv; tennis. 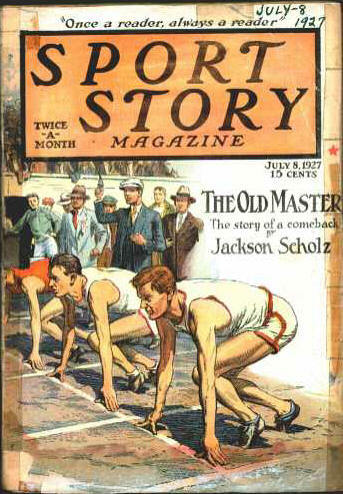 19 · The Old Master · Jackson Scholz · ss; track. 29 · A Question of Flies · Charles Rodda · ss; baseball. 42 · NebuchadnezzarThe Dark Light Horse · H. Glynn-Ward · ss; polo. 55 · Young Hurlcules · William Bruner · ss; shot-putting. 74 · It Was in His System · Ralph E. Mooney · ss; baseball. 84 · An Accidental Cupid · Kingsley Moses · ss; golf. 94 · Off the Ropes · Maurice W. Denk · ss; boxing. 103 · The Back-Stepper · Walter E. Hartman · ss; baseball. 114 · Lazy Mans Stroke · Raoul F. Whitfield · ss; canoe racing. 122 · On Logs Awhirl · Hal Rammel · ss; log-birling. 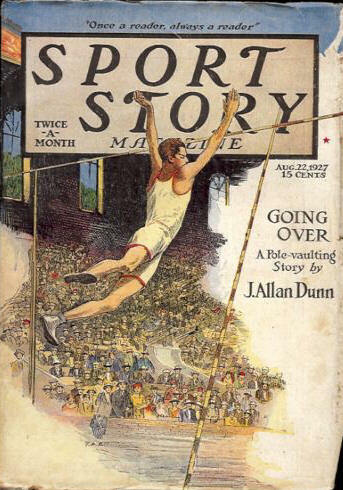 3 · Going Over · J. Allan Dunn · ss; pole vaulting. 16 · Wide Open! · Raoul F. Whitfield · ss; airplane racing. 25 · The Iron Man · Kingsley Moses · ss; baseball. 39 · Golf by Order · Milton C. Thomas · ss; golf. 67 · The Big Little Man · W. Carey Wonderly · ss; horse racing. 83 · The Deuce Loser · Stuart Osborne · ss; tennis. 93 · Water Wise · Charles Dana Bennett · ss; motorboat racing. 104 · When Good Fellows Got Together · C. A. Osier · ss; handball. 115 · Shoe Strings · William Henry Wright · ss; baseball. 123 · The Pinch Quitter · James W. Egan · ss; tennis. 3 · The Green Lantern · Moran Tudury · na; football. 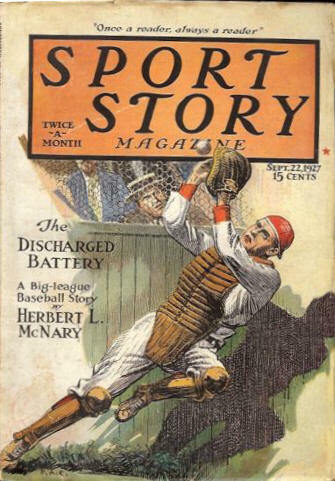 45 · The Discharged Battery · Herbert L. McNary · ss; baseball. 59 · Sleepy Joes Race · Sam Carson · ss; horse racing. 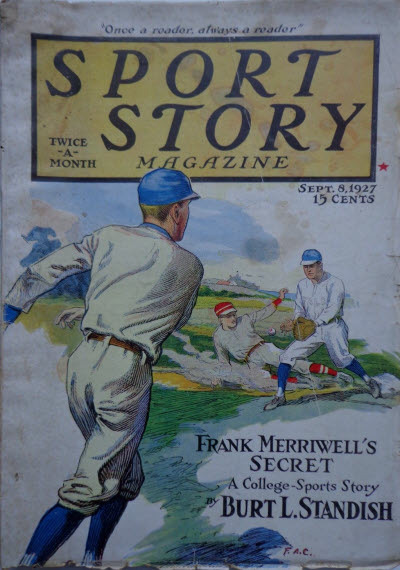 82 · Frank Merriwells Secret [Part 2 of 2; Frank Merriwell] · Burt L. Standish · sl; baseball. 114 · Coogans Bluff · Jonathan Brooks · ss; baseball. 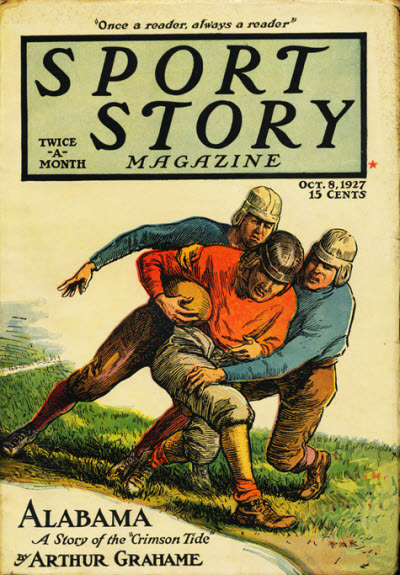 127 · Strategy · Raoul F. Whitfield · ss; football. 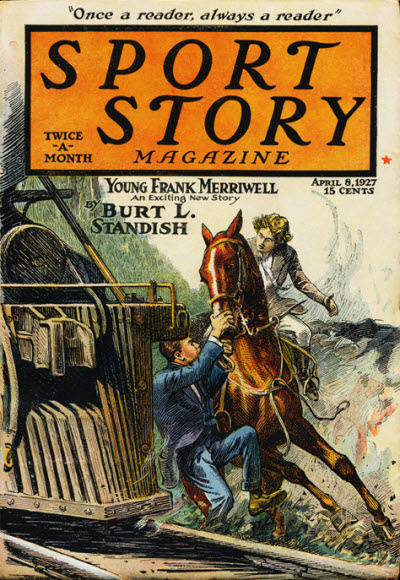 3 · Frank Merriwells Enemy [Part 1 of 2; Frank Merriwell] · Burt L. Standish · sl; college-sports. 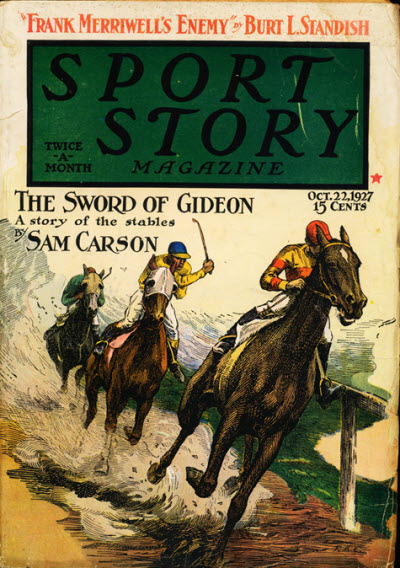 26 · The Sword of Gideon · Sam Carson · ss; horse-racing. 40 · The Soccer Sucker · Charles Rodda · nv; soccer. 61 · Time Out for Willie · Hubert La Due · ss; football. 73 · Forty-Ninth · Kingsley Moses · ss; cross-country. 90 · The Thirteenth Jump · Moran Tudury · ss; steeple-chasing. 102 · Ken Tries for Quarter · Robert Ahern Cutter · nv; football. 122 · Some Off and One to Go · Jackson Scholz · ss; golf. 1 · The Big Man · William Bruner · nv; cross country. 71 · Pardon Me · H. Glynn-Ward · ss; polo. 127 · Mental Hazard · Frank Richardson Pierce · ss; golf.